On May 23, 2015, Nash and his wife were killed in a vehicle accident on the New Jersey Turnpike near Monroe Township, New Jersey. They had been on their way home from the airport after a visit to Norway, where Nash had received the Abel Prize, when their taxicab driver lost control of the vehicle and struck a guardrail. Both passengers were ejected from the car upon impact. State police revealed that it appeared neither passenger was wearing a seatbelt at the time of the crash. At the time of his death, the 86-year-old Nash was a longtime resident of West Windsor Township, New Jersey. 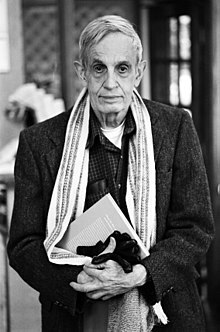 He is survived by his son John Charles Martin Nash who lived with his parents at the time of their death, as well as his other son, John Stier. Sylvia Nasar (2002). "Introduction". In Harold W. Kuhn; Sylvia Nasar (eds.). 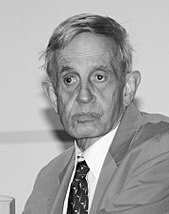 The Essential John Nash. Princeton: Princeton University Press. pp. xi–xxv. ISBN 978-0-691-09610-0. JSTOR j.ctt1c3gwz0. This page was last edited on 21 April 2019, at 04:16 (UTC).